Bronze Nazareth is a rapper & producer associated with Wu Tang Clan, and is also a member of Wisemen &Wu Elements. The Michigan born talent has worked with numerous legends in the game and has featured on tracks alongside Rza, Raekwon The Chef, Inspectah Deck, Pete Rock, Craig G, Sean Price Killah Priest, Sunz Of Man, Kurupt of Tha Dogg Pound, Masta Killa, and this year dropped a full album with rap legend Canibus. With a new album on the way and a string of projects being made we welcome a man whose known for rocking the mic. 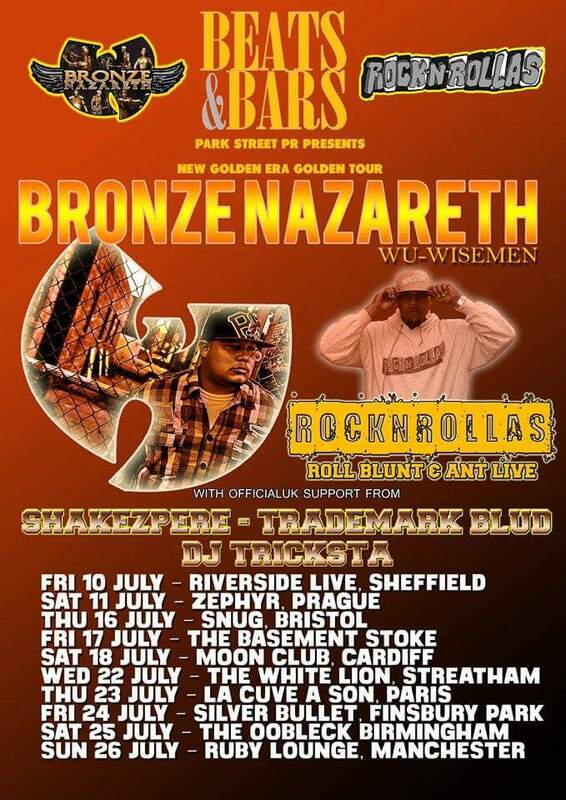 Bronze Nazareth is somebody that any real Wu Tang fan should see live… Wu is in the building. Rocknrollas are a UK/USA duo of producer Roll Blunt from London, UK and rapper/producer Antlive Vs Skeletor from Detroit, USA. They recently blew up the underground with their album ‘No Country For Old Men’. Together they make authentic Hip-Hop bangers that any real fan of Hip-Hop music will adore. Antlive is no rookie, and as the driving force behind and member of MF911, his group signed to Polygram back in the 90’s with video rotation on MTV, BET & The Box. He has worked with the likes of RZA, Allah Mathematics, Raekwon, Ghostface Killah, Method Man, Proof, Public Enemy’s Chuck D & Scarface from Geto Boys. For any audience starving for creativity and that real old school underground 90’s vibe, we welcome you to Rocknrollas! Trademark Blud is a Midlands based rapper who is going from strength to strength and recently got signed to Platformz, a Chicago based Hip-Hop label run by producer Rediculus. He has blessed stages all over the UK this year playing alongside the likes of Micall Parknsun, Skinnyman, Rewd Adams, as well as performing at this year’s Boom Bap Festival. His energetic live show is something that every Hip-Hop should experience and with his debut EP ‘Blud On The Brain’ out soon expect more and more from this talented emcee! Tricksta is DJ & producer who has had over 25 years experience in the game. He has played all over the UK as well as Houston, Miami, San Francisco, Los Angeles, Amsterdam, Stockholm, Istanbul, Zurich, Cannes, and this year warmed up for Jeru The Damaja’s Birmingham, UK date as well as playing at Boom Bap Festival. He is known for running the UK’s longest running mixtape series UK Runnings, and has done mixtapes with Sheek Louch, Papoose, Red Cafe, Three Six Mafia, 40Glocc, Freaky Zeaky, French Montana, Ali Vegas and more.